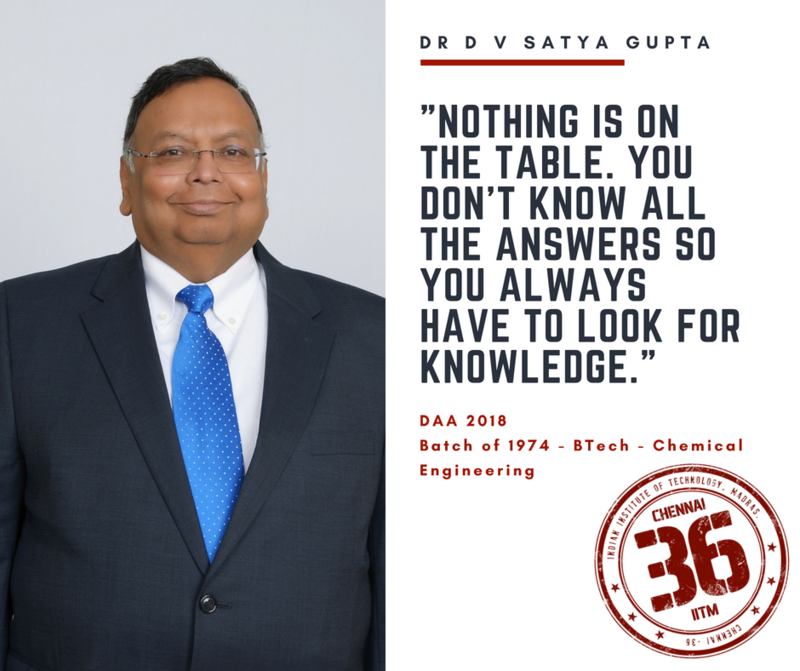 Dr. Satya Gupta is among one of the DAAs of this year. He is a graduate from the Department of Chemical Engineering, the batch of ‘74. He currently works as a Technology fellow at Baker Hughes, a GE company. He takes us on a ride through the journey of his life. Could you recollect your journey at IITM? Yeah, It was sort of strange. IIT was never in my plans. And it so happened that I’m glad it happened. More than the education we got here, the friendships we made here as well as one of the things I learned was teamwork and critical thinking more than bookish knowledge. I was also involved in the hostel affairs, I was also a mess secretary and also the General Secretary. It taught me quite a bit on how to interact with people and some management skills, of course at that time I didn’t know that’s what it was but overall later in life it all came back. So overall it was a very fun experience. How does it feel to be one of this year’s DAAs? It is very humbling to be chosen as one among quite a few numbers of people who graduated over the years. It makes me feel very proud and at the same time humble. It’s something that I will cherish for the rest of my life. Why do you think you chose oil and energy industry as your area of exploration? It’s strange. I didn’t choose oil and gas, it chose me. As part of my doctoral thesis, I worked in the area of biomedical engineering actually. I worked on encapsulations. So when I was getting out of the University there was a job offer from Gulf research mainly to look at encapsulating corrosion inhibitors and also when I was at IIT, there was a retired director from Central electrochemical research, he taught us electrochemical corrosion so I knew little bit about corrosion and I knew how to encapsulate. So that’s how I got into the industry and then I got a big contract with the USA air force for encapsulating corrosion inhibitors for aircraft coatings and that’s how I indirectly got into the Industry. You are working as a Technology Fellow at Bakers Hughes. How has your experience been so far? For the last 3 years, I have been a Technology Fellow. There are three of us in the company with this position. It’s like being an emeritus professor in a university. We give advice to management in the areas in which we should be investing. So the three of us have different backgrounds, I concentrate on chemistry, chemical engineering, material sciences etc. So I look at what is the emerging sciences that would then be applicable to develop a technology. A few years ago we started nanotechnology and now we are looking at different kinds of biomimetic technology, trying to imitate nature and from that find applications whether in chemistry or polymers. So it’s a lot of fun, I work with a lot of universities to see what research they are doing and we also fund some of them. Its freelance, it gives me a chance to touch base with what is going on not only in our industry and look into other industries to see if I can transfer the technology to our use. So it’s a lot of fun. Could you elaborate on your contributions to the Pressure Pumping Technology? I started as I said with the encapsulations in the 80’s. So one of the challenges was we used a lot of natural polymers for fracturing applications. So I started looking into encapsulating some oxidizers and enzymes to be able to degrade them. Once I started, based on some of the polymer technology, I started getting more and more fracturing knowledge. And in the early to mid-80’s, there was a lot of effort in developing tight gas in North America so I started working in that area and recently in the last 10 years the Shale Oil Revolution has happened and since I’m working in this field for a long time, industry has recognized me as one of the experts in that area. In terms of Pressure Pumping, even though I have worked in cementing the technology, Fracturing Technology is what I am considered as an expert at. Last year, the Society of Petroleum Engineers gave me an award for my contributions in the completions and production optimization for my work in the area of Fracturing Technology. Also, I have worked on a lot of non-water based technologies. This essentially is my contribution to the industry. You have been very successful in research and have more than 70 international patents and more than 80 US patents, what do you think it takes to be successful in research? Curiosity. You need to be Curious. Nothing is off the table. You don’t know all the answers so you always have to look for knowledge. The reason behind most of the patents that you have mentioned was the team effort, I had really amazing co-inventors along with me. So it is very essential to have a good team working with you. The patent is just an invention, for it to become an innovation you need to make money from it (because I work in the industry, we need to make money out of it). If there is no commercial interest and no commercial value, the company won’t spend money on applying for the patent. So it’s not just developing the technology but you also need people in operations, sales and across the value chain who believe in you and your technology and push it forward. Research is just a part, applications – the way you apply your research is very important and more than anything you need to be curious, you need to look at what is happening around you and not only in the industry you are in so that you could try and use them in your research too. What motivated you to pursue your higher studies and build your career in the USA? I never wanted to go to the US. When I was in my final year I and my friend were applying for universities abroad but I never had the plan to study abroad but I applied as a backup option. I ended up not getting a job but acceptance letters with the scholarship from all the universities I applied for and that friend who was applying got a job but not even one acceptance from the universities. Till today we reminisce that it would have been the other way round. Then after coming out of the University, I got a job and I just fell into the system. And the system there is in such a way that you wouldn’t want to be out of it. How does to feel to come back to the campus of IITM? Do you follow the research activities going on in our campus? First, I’m very glad to see that they have preserved the environment, whether it is the animals roaming around and the trees. It’s very nice to see that it’s been preserved in spite of buildings here and there. So yeah, the atmosphere is still there as it was during my time. Unfortunately, I don’t follow as much as I should. I hope to in the future. I follow a lot of technical literature at least in the areas of my interest. I feel I should spend a little bit more looking at pure research which is what I generally look for so I can translate it into our applications. Generally, I have not but going forward if somebody approaches me, I’m sure I can contribute. I am involved with a number of universities in the US like the University of Texas and I also guide some of the students in their Ph.D. thesis. I would be glad to do the same here too. According to you, what are the major impediments faced by the research scholars in our country? Is thought process. One of the things I see is (IITs are an exception), IIT teaches you what I call system thinking whereas typical Indian education is very linear and very singular thinking. They are very good in pure sciences but when it comes to technology, they are in a box, they don’t know how to integrate various things into a system. That is one of the advantages of IIT education had at least in those days, I hope it still is the same now. Any final words of advice to students of IITM? I think you are very lucky one way or the other that you are in IIT. Once you enter IIT, it makes you one of the privileged ones. The bookish education you can get anywhere, but the knowledge and wisdom you gain here are really useful. The friendships that form here are one of the most memorable ones. Most important aspect is how to find knowledge and as long as you get that it doesn’t matter where you end up. Don’t plan for a lot of things because you can plan all you want but somebody else decides what happens.